Diabetes (including its precursor, Metabolic Syndrome) is one of the top five most significant diseases in the developed world and is rapidly becoming a burden in the developing world too. However contemporary research has found that several spices including cinnamon, garlic, fenugreek and caper have the potential to be effective natural treatments for diabetes. In order to understand the management of diabetes, it is helpful to consider one of the most important underlying defects in this disease; that of insulin resistance. Before a cell will allow glucose through its protective membrane, its insulin receptor must be "turned on" by insulin or a chemical mimic. Insulin resistance occurs when the receptor develops a weakened response to insulin resulting in the cell's failure to absorb sufficient quantities of glucose from the blood. This process culminates in energy deprivation in the cells and raised blood glucose levels. The primary cause of a poor insulin receptor response is the chronic over-production of insulin. Not only does too much insulin lead to receptor failure, but wide fluctuations in insulin levels are also known to be an important cause of this condition. These oscillating levels are, in turn, closely associated with a diet high in refined carbohydrate foods. Extreme changes of insulin levels and associated insulin resistance are abnormalities common to both diabetes and metabolic syndrome and are typically the result of a diet dominated by high glycemic index foods. The rapid absorption of high GI foods results in abnormally high blood glucose levels. In order to stimulate the cells to absorb this sudden glucose load, the pancreas responds by releasing larger than normal quantities of insulin. The excessive amount of insulin produced to achieve this effect results in a sudden fall in blood glucose, and within a couple of hours this level becomes very low. The subsequent intake of more high GI foods causes the blood glucose to rise dramatically once more, perpetuating the cycle of wildly fluctuating glucose and insulin levels. If this steady bombardment of the receptors by large amounts of insulin continues over a long period, it eventually leads to their insensitivity and malfunction and, finally, insulin resistance. One of the best natural treatments for diabetes is a good diet and it is the most effective ways to prevent insulin resistance. The consumption of predominantly low GI foods means that insulin is released slowly. As a result, glucose is absorbed by cells in a controlled manner and blood glucose levels do not rise and fall so rapidly. This prevents the harmful glucose - and thus insulin - peaks and troughs that are associated with the repeated ingestion of large quantities of high GI foods. Reducing the proportion of high GI foods in the diet has another, indirect benefit in terms of preventing insulin resistance. Such foods are typically fattening and reducing their intake can lead to weight loss. Obesity, and particularly "central obesity", is another other important cause of insulin resistance and tackling it is an effective way to reduce the risk of diabetes and other chronic diseases. Other invaluable dietary tools for preventing and managing insulin resistance and diabetes are the spices. These foods counter the disease processes in several ways and can be tremendously helpful, irrespective of whether individuals are making dietary or other lifestyle changes. Cinnamon, for example, is a potent inducer of insulin sensitivity and the addition of as little as one gram a day to the diet can reduce the blood glucose levels of diabetics by a staggering 30 percent. It does this by enhancing the enzymes that increase insulin receptor sensitivity and inhibiting those enzymes with the opposite action. Cinnamon has the added benefit of lowering the abnormal lipid levels commonly found in diabetics and reducing oxidative stress caused by lipid oxidation in these patients. Cinnamon is now available as a powder or an extract as a treatment for diabetes. Fenugreek is also highly effective at modulating glucose metabolism and can lower the blood glucose levels of diabetics by up to 45 percent. This spice both increases insulin receptor sensitivity and normalizes the imbalanced blood lipid levels of diabetics. The fiber contained in fenugreek also lowers the GI of a meal, thus modulating the post-prandial blood glucose levels by slowing the absorption of high GI foods. Ginger and caper increase sensitivity to insulin, and caper mimics the effects of insulin. Garlic and coriander are also insulin mimics, while coriander enhances insulin secretion. These and most other spices can, with their rich array of antioxidants, help to prevent the complications of diabetes by reducing the oxidation of fats. Several spices, including chilies, can also help combat associated conditions such as obesity by increasing the metabolic rate and therefore helping to "burn off" excess calories. Spices possess an amazing potency and range of weapons in the fight against diabetes. 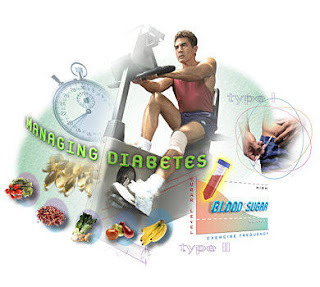 By helping to prevent, delay and even treat one of worst and most widespread chronic diseases afflicting the modern world, they offer useful, natural treatments for diabetes.